The 1910 county jail structure, now part of the Museum of South Texas Texas History, as it looks today. EDINBURG — Groundwater flows just feet under parts of the city. 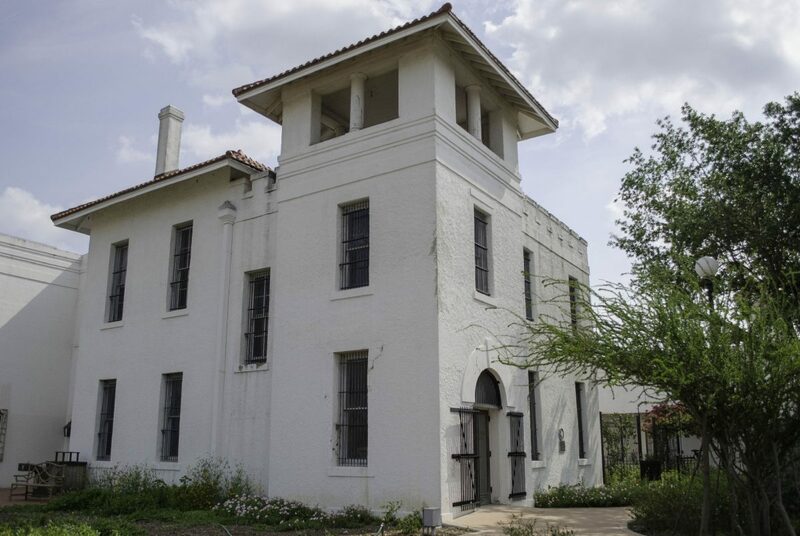 The high water-table has been creeping into the 1910 Hidalgo County Jail, recognized as a Texas Historic Landmark, scarring the building. 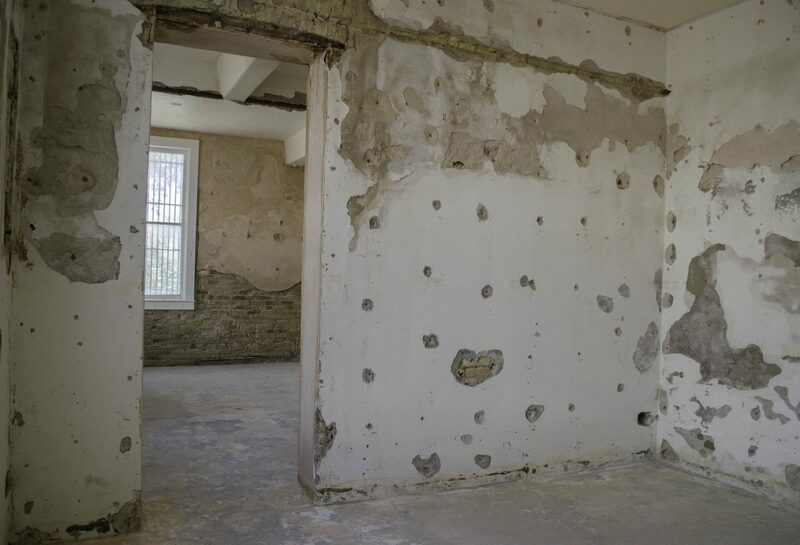 Rising damp, unwanted moisture seeping into a structure, plagues the historic site and caused its closing to the public in 2012. The Museum of South Texas History is located on the Hidalgo County Courthouse square, and sees the old county jail as a “cornerstone of the museum,” according to the Executive Director Shan Rankin. 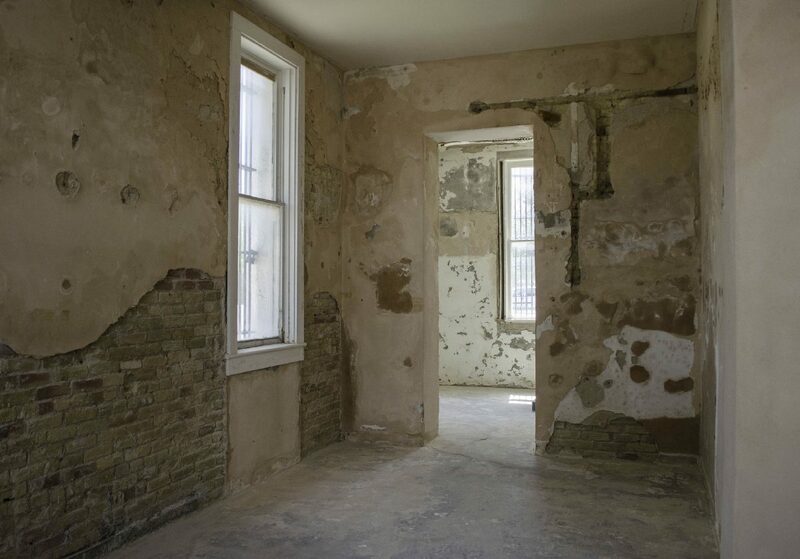 The walls in the old jail section of the museum have been stripped down to expose the original structure. Hundred-year-old brick is exposed through layers of weathered stucco on sections of the old jail structure. Rankin called the jail a “cornerstone” of the museum and a reason why that location was chosen when the museum organization was formed in the 1960s. Hundred-year-old brick is exposed through layers of weathered stucco on sections of the structure. Visible rusted steel beams and mesh are evidence of the moisture. Consultants experienced in restoring vintage masonry stricken with rising damp advised intermediate and long-term steps, including a new roof to stop leaking. The master plan calls for moisture-blocking stainless steel pieces set into the interior and exterior brick, like the mockup piece recently installed along a wall of the museum. The staff credits the municipalities, groups and individuals that contributed to the years-long fundraising campaign. This contributes to drainage issues, he said. As part of the demolition process and assessment, the team cut through the slab attempting to reveal the jail’s footing. A hole was dug, failing to reach the building’s base revealing “brick sunk deep into the earth and sitting in water,” Rankin said. The director walked through the two-story jail outlining a tentative layout for the new exhibit space, her voice echoing through the dilapidated relic. Paths carved through brick to house electrical wires are now bare cuts to the brick, as per the master plan. Rankin said the most frequent comment from visitors is about when the jail will reopen. Construction resumes in July and will last at least a year, museum staff said. There isn’t a definitive timeline for the creation and installation of the exhibit. Museum staff met with exhibit consultants this week to consider the details for the space. Officials aren’t sure if the slab is salvageable, and they expect other potential delays if new issues arise. The team will assess the viability the steel beams, as well. There aren’t many historic buildings left in our region, she said. The jail was a “companion piece” to the original courthouse, which was torn down in the 1950s and replaced by the 1954 building. As historians, museum officials are excited to dig into the building in hopes of learning more about its story. This could include better understanding the hanging mechanisms. Texas counties were once responsible for local enforcement of capital punishment, and one man was executed from the jail’s gallows. Museum officials are asking the community for any photographs they may have of the jail’s interior. No images of the interior are known to exist, Rankin said. The Museum of South Texas History is located in downtown Edinburg at 200 N. Closner Blvd. Hours are 10 a.m. to 5 p.m. Tuesday through Saturday and 1 to 5 p.m. Sunday. For more information, visit www.mosthistory.org or call (956) 383-6911.